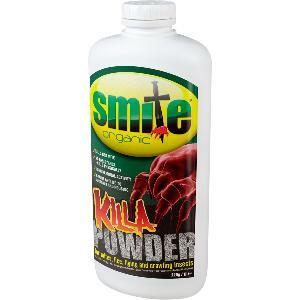 Smite Organic Red Mite Killa Powder is an organic Killa. It is a naturally-mined, mineral product made up of fossilized remains of diatoms, a type of hard-shelled algae. Smite Organic Powder kills insect pests by breaking down the waxy exoskeleton and then absorbing lipids and body fluids, which causes them to dry out and die. For the control of Ants, Fleas, Bedbugs, Cockroaches, Stored Product Insects, Mites (including Red Mite), Book Lice, Silverfish, etc. Smite Organic Killa Powder and spray are particularly effective at killing red mite which are found in poultry and in/around poultry housing.